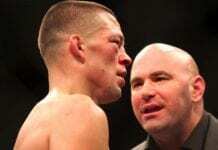 Nate Diaz and Gray Maynard will get a chance to establish once and for all who’s the better man when they meet for a third time at The Ultimate Fighter 18 finale on November 30th. They are currently one apiece against each other, with Diaz having originally defeated ‘The Bully’ by submission en-route to winning TUF season 5, while Maynard rebounded with a very close split decision win in 2010. Diaz moved up to welterweight after that defeat, going 2-2, before dropping back down to mount another assault on the lightweight ranks. He did just that with wins over Takanori Gomi, Donald Cerrone and Jim Miller setting up a shot at the title. He lost by decision to the champion, Ben Henderson though and then suffered the first TKO loss of his career against Josh Thomson in April of this year. Maynard hasn’t had nearly as many fights over the same period, but has followed a fairly similar trajector in the lightweight division. After defeating Diaz he claimed a victory over Kenny Florian to earn his shot at the 155lb title. He then engaged in two memorable battles with the champion at the time, Frankie Edgar, taking him to a draw in their first encounter before being KO’d in the rematch. Maynard rebounded with a win over Clay Guida, but then was overwhelmed by TJ Grant in the first round at UFC 160 in May, losing by TKO. So, there’s a lot on the line here for both fighters, not just for the personal pride and bragging rights of winning the rubber match, but also due to the fact that they both need to get back in the win column if they want to remain part of the lightweight elite. Presumably this fight will be the main event at the TUF 18 Finale in Las Vegas, though that’s not been confirmed at this time.